do if you were ever attacked. You'll have the skills to defend yourself, and get away. No matter where you are, you'll feel safe and secure and confident. You'll simply radiate confidence. TRAINING IN MARTIAL ARTS WILL MAKE YOU SET GOALS AND GO AFTER THEM. PLUS YOU WILL HAVE A WHOLE TEAM TO HELP YOU GET THERE. Our adult program is designed to challenge all levels of fitness without feeling overwhelming. Our instructors will help to tailor the exercises to work within your fitness ability. 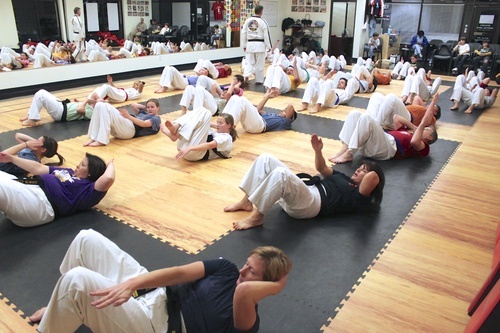 Classes are built on a structure of cardio vascular conditioning, muscular strength and toning and flexibility using traditional martial arts training as the foundation. Adult students are breaking wooden boards when testing for next rank. 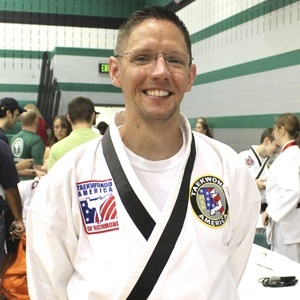 Training in martial arts and self-defense is also lots of fun. You will make great, lasting friendships.